DJ Tennis - DJ Tennis DJ-Kicks. Vinyl LP, CD. Bleep. DJ Tennis gets a much-deserved reward for his years of service to the game in the form of his own DJ Kicks installment. The tracklisting here is full of the tender-yet-tough house stylings that have become the producer’s trademark over the years, and he guides the mix beautifully for its continuous 150-minute run-time. As well as big hitters from the likes of Caribou (the Four Tet remix of ‘Melody Day’) and Kenny Dixon Jr. (‘Soul Sounds’), we are also treated to some new work. 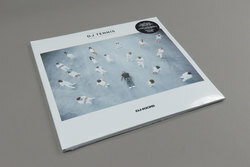 The two Tennis remixes - of Pole’s ‘Raum 2’ and Frank Bretschneider’s ‘Go! Said the Bird’ - are delightful realisations of his aesthetic, at once rugged and warm, and his new bit with Fink towards the end of the second disc is soulful and stirring.